Working as a Cheesemonger at Fromagination requires an interest in cheese, clearly. Part of the customer education that Fromagination employees carry out in our downtown Madison shop is focused on connecting people to their food. This means we need to know where the cheese comes from (and, before that, the milk), who makes it, and why and how it’s made. Just as the Dane County Farmer’s Market – right outside our door on Saturday mornings! – helps to connect people to their food, our cheesemongers must also be able to tell customers the details about the cheeses and other items they see at Fromagination. So…working at Fromagination also requires some active study of the rich Wisconsin cheese-making culture. Hence, Fromagination tries to get employees out of Madison to visit the people who make the artisan cheeses that they sell daily. 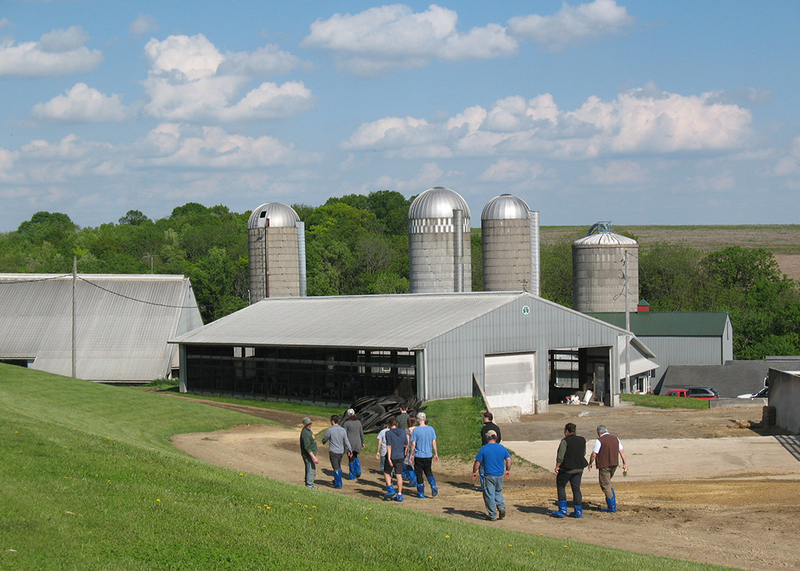 In late May, seven Fromagination staffers went on a day-long tour, organized by the Wisconsin Milk Marketing Board (WMMB), to allow staff a chance to meet producers, taste cheese, see three different processes from beginning to end, and to see a dairy farm. It was a quick trip, but rich with little moments of learning. We saw a variety of equipment; demonstrations of sanitation, storage and packaging; varying attitudes about cheese types and pairings; and a lot of lovely terrain in southwestern Wisconsin. We also met a group of people who are proud of their work, products and legacy – one that more and more people have become aware of as our local cheese culture grows (no pun intended). In upcoming posts, we’ll tell you what we learned at those four stops.